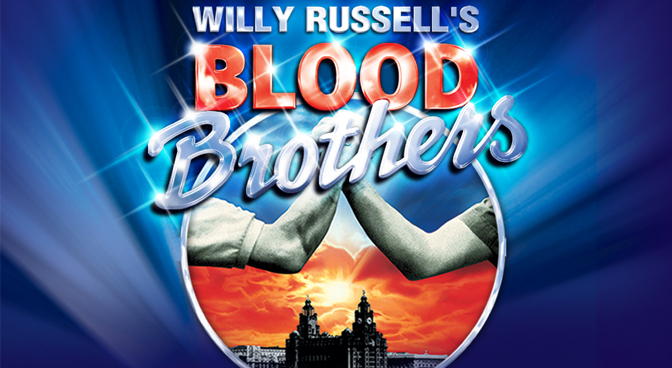 Blood Brothers opened at the King's Theatre this week, just over two years since its last visit to Glasgow. A stalwart of the touring circuit, at 29 years old Blood Brothers still fills theatres wherever it goes and Glasgow is no exception (especially when the cast features Marti Pellow!). The show tells the tragic tale of twins separated at birth and the twists that ensure their lives are inextricably intertwined resonates with audiences with the hard-hitting impact of a recession and class differences particularly relevant at present given the recent economic downturn. Unusually for a touring production, the lead cast members remain largely unchanged from the last tour with local star Marti Pellow reprising his role of Narrator only for the two week engagement in Glasgow. Sean Jones, who also starred in the last tour, has played Mickey Johnstone on the West End and in touring productions and it's plain to see why he was chosen to play Mickey in the closing production in London. His definitive portrayal of Mickey is inimitable and he takes the audience on an emotional journey from Mickey's youthful exuberance in Act One to the broken husk of a man at the end of the show. The transition is remarkable and leaves the audience heart-broken at the cruelty of circumstance. Playing opposite Jones as the twin who is given away, Joel Benedict is an excellent foil bringing Eddie's charm, class and hope to life while bravely championing his friend Mickey. Benedict brings an innocence to the part that ensures Eddie is as much the victim of the piece as Mickey. As the "girl in the middle of the pair" Linda, Danielle Corlass successfully brings Linda's youthful naïveté as a teenager to life but also Linda's dedication to Mickey at her own personal cost as she ages. Where Blood Brothers always particularly shines is in Act One where the cast perform as children. Reprising his role as Sammy, Daniel Taylor is brilliant and the entire cast are superb in Kids Game. Jones also brilliantly delivers Mickey's "nearly eight" monologue, nailing the sense of injustice that children feel so strongly. Maureen Nolan returns as Mrs Johnstone, the mother forced to make an impossible decision to give one of her children away in the hope of him having a better life, and she pours every ounce of emotion into her performance. Her anguish and distress in the closing scenes is difficult to watch and even well into the curtain call, during a well deserved standing ovation from the audience, she struggled to recover from her epic performance of Tell Me It's Not True. If the role of Mrs Johnstone is miscast, as I have seen in the past, it can be hard to sympathise with her predicament but Nolan effuses love for both sons in such a way it's impossible not to empathise with Mrs Johnstone as the piece reaches its heart-wrenching conclusion. A clear audience favourite, the criticisms made in my review of the 2012 tour (including a failure to update an interview in the programme with producer Bill Kenwright) still stand and the show is in need of an update, particularly in its dated soundscape. However, it's a story with heart that is as poignant now as it was when it was first performed and the tear stained audience that left the theatre is a testament to its ongoing success. Blood Brothers is set to continue well into its 30th year and its longevity is certainly due to its ability to capture audiences of all ages with its emotional story.